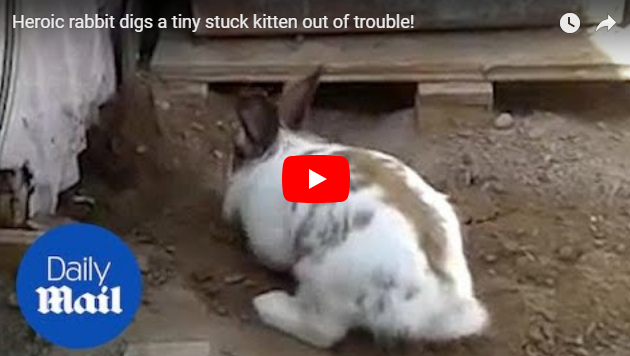 MFS VIRAL VIDS-2: Heroic rabbit digs a tiny stuck kitten out of trouble! That is one clever rabbit! And the way he plops down to take a break after all that digging... priceless. Chasky the rabbit comes up with a genius solution to free his cat friend, Pelu. The fluffy pet quickly digs a hole near the shed for the cat to fit through at their home in Spain. After the bunny is done, it hops away and takes a well-deserved rest after the rescue effort. Pelu goes to thank his fluffy friend for the help when he finally gets out.